I am very honored by your interest in becoming a Premium Member. If you want everything I produce on a daily basis and have access to my best pattern observations and the most trade alerts, take advantage of Premium. Goal: provide research to help investors enlarge their portfolios regardless of market direction by looking for charts patterns at extreme points of “exhaustion” that have a high probability of reversing. All weekly research reports are included! 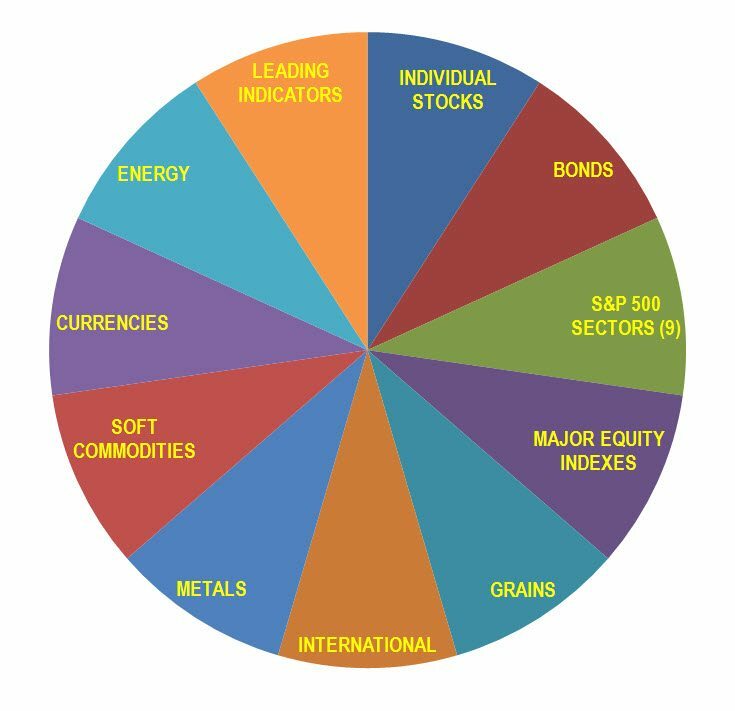 in the major market indices, sectors, commodities and the metals markets. I produce research for premium members daily, sometimes more than once a day. High probability opportunities are found at long term multi-year weekly support or resistance. For example, I look to identify breakouts out of falling resistance or wedge patterns or bullish ascending patterns and alert members as soon as my alerts are triggered. Alerts consist of sending an email with “Taking Acton” in the subject line, the asset, action to be taken and the date. In the body of the email I include the asset name, symbol, chart with pattern analysis showing where and why I’m taking action, and the initial stop price. And I alert members when I take profits and update stops along the way. We provide a fact sheet we ask you to complete to help us get to know you, your management / trading style, other tools you use, books and mentors you may have learned from etc. The more we know, the better we can help you! Members should consider position size and stops based on their risk tolerance, experience and objectives. We truly want to hear from you along the way so we can help you make the most of the research. Below is an example of a multi-year pennant pattern that had been forming in the financial sector (XLF). This type of pattern, including the multi-year time frame, was set up for a huge move. 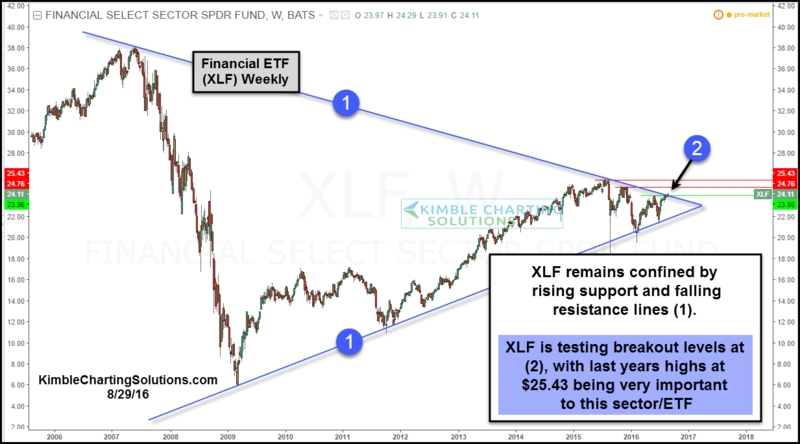 We waited patiently and alerted members on a breakout to the upside back in late August 2016 to buy XLF or any bank or financial stock they had been following. 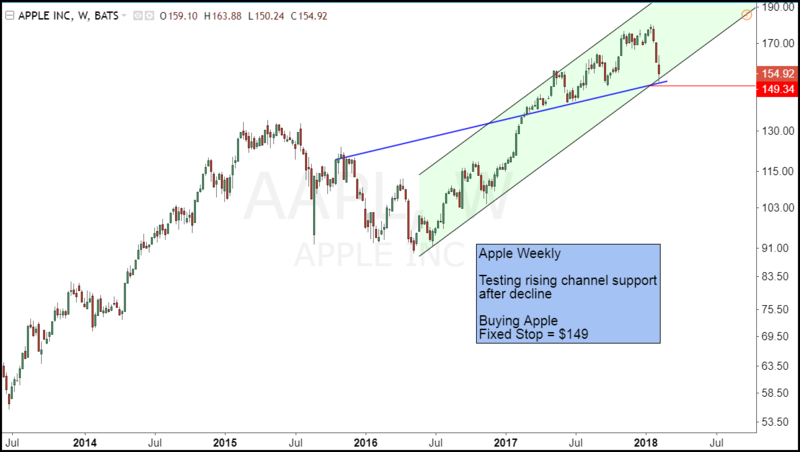 Below is an example of a weekly pattern & opportunity in Apple (AAPL) that I alerted members to buy in Feb 2018. Apple suffered a precipitous decline and was on two support lines going back approx 2 years. To avoid potential bias toward assets I may be tempted to favor at times, I will often quiz myself by hiding the asset name. I share these with you at times to test yourself. This proprietary indicator is a critical tool used to provide advance warning of major turning points in the broad markets. The Shoe Box tends to turn down before major highs and up before major rallies. The underlying components are proprietary but involve pricing swings in the credit markets, over weighted towards corporate credit conditions. We use this tool as a gauge to suggest when to overweight allocation to equities on a breakout of the shoe box and underweight equities on a break of support. 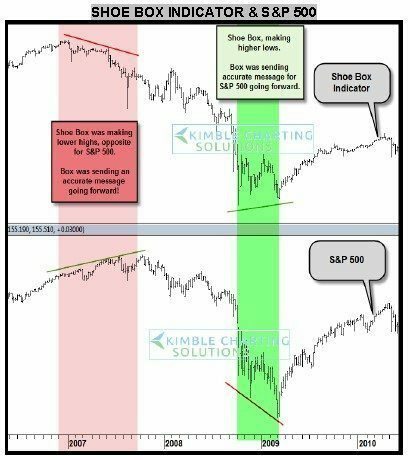 A break of BOTH the Shoe Box indicator and broad US equities signals an opportunity to take or add to short positions for those looking to capitalize on the downside. I look forward to helping you capitalize on the Power of the Pattern!